Magnetic stirring is a widely used and long established method for stirring and mixing in liquid media. The process is not only simple and inexpensive, but extremely diverse in the range of application. Examples include: synthetic procedures, drug delivery, chemical analysis, flow control, emulsification, milling and grinding and solid phase extraction. 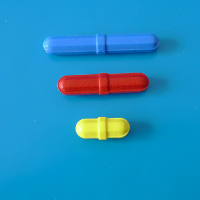 Magnetic stirring can be used in open and closed systems, over a range of positive and negative pressure, over a broad temperature range and with virtually any chemical reagent. The use of bearings, glands, seals and complex drive mechanisms common to other mixing systems are not required. 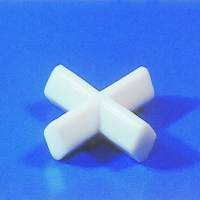 PTFE is the material of choice for encapsulation because of its almost total chemical resistance and its wide range of working temperature -200˚C to +280˚C. 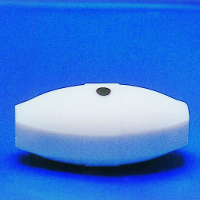 It is difficult to quantify the most effective shape for a particular stirring application, some shapes are self-evident, for example, an oval or egg shape for round bottom containers or a flat and triangular shape where a scraping action is required, large containers generally require large stirring bars. For very viscous liquids a vaned stirrer at slow speed is required, while for stirring in shallow dishes a long thin stirrer also at slow speed is effective. Often, however, selection is a matter of choice or trial with various shapes. 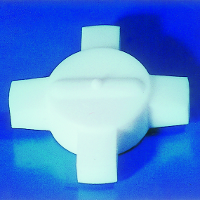 PTFE is a relatively soft material and the rubbing action against the surface of the container may generate small particles. In an application where the generation of such particles must be avoided, the stirring system must be evaluated before actual use. Generation of particles is reduced by careful selection of the shape of stirrer, ensuring the contact surfaces are smooth and even, not using an over powerful stirring bar or use suspended stirring. De-coupling in the form of spin-out, tumbling or migration is generally due to weakness in the strength of the magnetic circuit, a mismatch in the sizes of drive magnet and stirrer bar or a stirring speed too high. Rare Earth Magnets may behave in an erratic manner due to increased strength and may migrate to one of the poles of the drive magnet or tumble with great ease and must, therefore, be selected with great care. 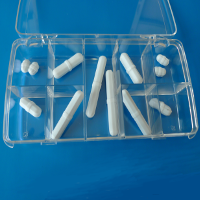 Due to to the strength of Rare Earth Magnets, there may be an increase in abrasion between the container and stirrer, which may cause increased particle generation. 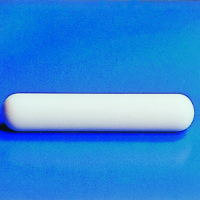 PTFE stirring bars can be sterilised by chemical or thermal means, but not by gamma radiation. Full traceability and change control agreements available on request.